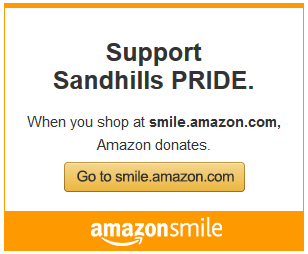 Sandhills PRIDE is committed to increasing the visibility of our local LGBTQ community and demonstrating its enthusiastic support for the wider community. We hold events throughout the year and post them on our active Facebook page to provide inspiration and fellowship, support local sister organizations, and raise needed funds for our important work. In 2018 alone, 65 Sandhills PRIDE supporters marched in the Pinehurst 4th of July parade, attended by thousands, and our volunteers served free ice cream to help 350 folks cool off in the heat. We encourage in-kind support for our friends at the BackPack Pals of Moore County, Boys & Girls Club of the Sandhills, Carolina Animal Rescue & Adoption, Friend to Friend, Hearts 4 Heroes, and Moore Buddies Stuff the Bus. We even have a Sandhills PRIDE Adopt-a-Highway sign (you should see us picking up trash along NC-211!) Our volunteers work tirelessly together lighting the way for equality and fairness. Come join us at one of our events if you haven’t already. You’ll have fun and help others at the same time!